Poor Sasha's family is moving and she's not invited. :( Sasha bear is about 3 years old. She's very loving and energetic, but can also just lay down with you. Sasha is potty trained, listens very well, and knows a few tricks like sit, lay down, shake, and hugs. Sasha is a true Akita and with that she can be very protective, because of this, she will need to be an only pet. 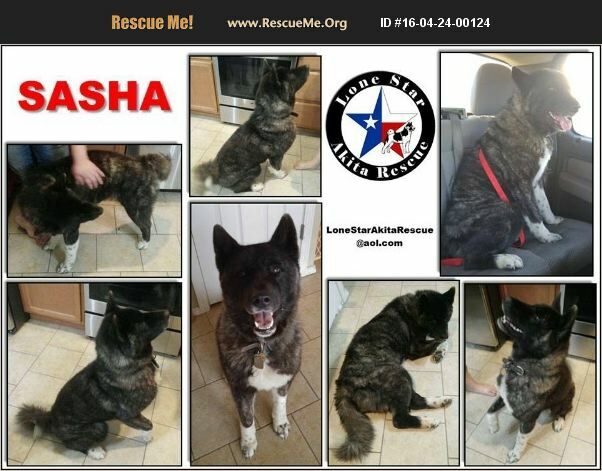 Adoption Applications can be emailed to LoneStarAkitaRescue@aol.com Print the app from this link: https://goo.gl/3MYgDk Or ask to have one emailed to you. Each dog is fully vetted prior to placement. At a minimum, this includes heartworm check, vaccinations, spay/neuter, and microchip. Any other medically necessary services are also performed.